It started in 2005 as a tender little seedling and has since developed into one of the most important events for fans of historic motor racing: the Bosch Hockenheim Historic – The Jim Clark Revival. It all takes place at the Hockenheimring Baden-Württemberg, a venue popular for its family atmosphere, open paddocks and accessible pits, the many great experiences it offers through its programme of supporting events and, above all, for the diverse and first-class array of historical racing cars from all classes and eras. From 26 to 28 April, 13 racing series will delight visitors to the Motodrom – last year we had 25,000. The “BHH” was started as a memorial to the two-times Formula 1 World Champion and superstar of his time, Jim Clark, who died in a tragic accident at the Hockenheimring in 1968. The name already says it all: BOSS GP stands for Big Open Single Seater. In July 2018, the fastest racing series in Europe was given exalted status par excellence: it was allowed to start as part of the Formula 1 GP. It certainly causes an acoustic sensation – with the characteristic screeching, for example, of the ten-cylinder F1 engines or the voluminous and powerful sound of eight cylinders. Visitors to the Bosch Hockenheim Historic can look forward to this concert, as the BOSS GP is celebrating the start of the season in the 25th anniversary year at the Motodrom. Where else? And of course, old hands Ingo Gerstl (Toro Rosso STR) and Phil Stratford (Benetton B197) will be on the starting grid again once more. Respect for the exclusive set of wheels seems an alien concept to them – in 2018, Gerstl won the Saturday race with a 0.3 second lead. The starting field includes yet more great single-seaters, for example from F2 and GP2, the World Series by Renault and the IndyCar Series. Premiere in Hockenheim: The “Canadian American Challenge Cup“ and the “FHR 100 Mile Trophy“ will stage their races together. More cars, better action! From 1966 to 1974, the CanAm kept spectators on the edge of their seats – thanks to extremely open regulations, they created winged monsters exceeding 1,000 HP, which achieved unprecedented speeds with a low vehicle weight and plenty of contact pressure. The oil crisis, however, made things difficult for the CanAm and the series was eventually discontinued. In historic motor racing, the magnificent times can live on. 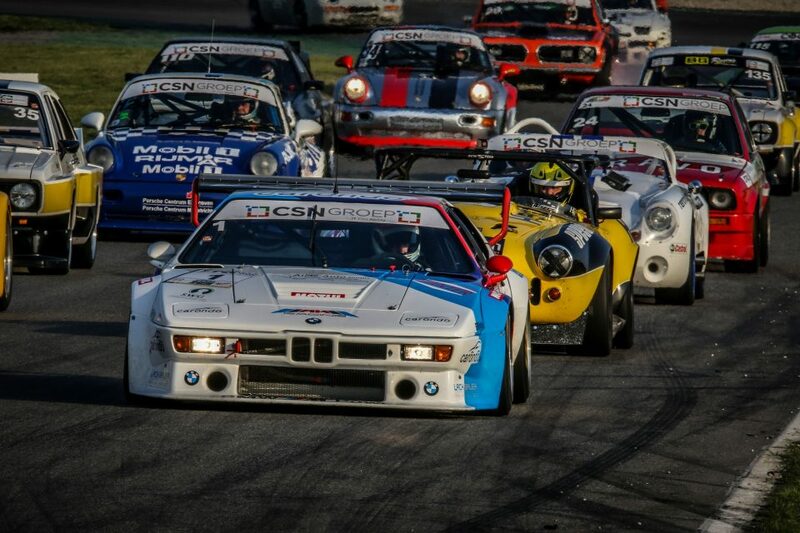 The FHR 100 Mile Trophy, founded in 2017, adds to the fascination of the new double pack with touring cars, GT cars and racing cars from the 70s and 80s (BMW M1 Procar, Ford Capri MK1, etc.). Raceclub Germany describes itself as a “loose organisation of GP and Formula car owners”. A real understatement! The historical jewels gathered here are unparalleled. These are just a few examples: Martini-BMW MK45, Arrows A10B F1, Formula Renault FR 2000, Talbot Lago T26c, Lagonda GP Car or Michael Schumacher’s Formula 1 Ferrari from 1997. By the way, being in technically perfect condition is a prerequisite for taking part. Demonstration runs are driven at a manageable pace. The FNT team’s highlights are its original, technically extremely demanding Toyota Formula 1 cars from the 2000s. You need a high level of engineering skill just to start the beasts! This year, FNT is offering a really special highlight: DTM crowd favourite Timo Glock will be driving his own Toyota Formula 1 car from 2008. This is the car that Glock drove on a slippery track that, through no fault of his own, shifted the world championship title towards Lewis Hamilton and away from Felipe Massa. For those who saw it, it is something they will never forget. Fancy getting an autograph from Timo at Hockenheim? A selfie? Surely not a problem! The Historic Formula 2, the racing series with a special link to the Hockenheimring, is booming. It experienced its heyday here in the late 60s and 70s, but it was then that it also had one of its darkest days: Jim Clark died in a Formula 2 Lotus at Hockenheim. The F2 was regarded as a talent factory par excellence, and successful GP drivers also raced in the F2 Monoposto on their free weekends. Visitors should definitely mark the Historic Formula 2 races in red in their schedules. The Lotus Cup Europe is also closely linked to Jim Clark. It was the Scotsman who was the reason for the brand’s special charisma. The official Lotus racing series, the only one of its kind in the world, is inspirational with its entire range of Lotus cars divided into different classes. As in every year, you can expect the “Historic Racecar Association” to give you full-on action and an extraordinary range of brands and classes. Formula 3 racers form the main backbone of the series, with a mix of cars from Formula Super Vau and other junior classes (legendary Formula Ford). However, you don’t have to have the fastest car in the field to be HRA Champion, since various factors are included in the score, such as the age of the car. Here, the same applies as with all the others: drop by, time for questions, photos or talking shop. Last but not least are the Mini Monoposti of the “FIA Lurani Trophy” (Formula Junior). Small Formula speedsters with a big impact: The rush for the Trophy, founded more than 60 years ago by Count Lurani as an inexpensive beginners’ series, is huge. “The sheer joy of driving”: That’s the motto of the “Youngtimer Touring Car Challenge”, in which a colourful starting field made up of touring cars, sportscars and prototypes compete – whether they be Melkuses, Jides, BMWs, Lotuses, Porsches, Trabants or Big Block Corvettes. The most important thing is that you drive as quickly as your skill allows you to and that everyone leaves the racing track with a smile. While the jovial Youngtimers have been a firm part of the Jim Clark Revival for years, “A Gentle Drivers Trophy” for GTs and racing sports cars built between 1947 and 1965, which was only initiated in 2015, will be celebrating its premiere. This period in history witnessed the dawn of a new era for car racing. An era when you drove your own racing car to the track and small private teams were able to leave the established teams behind, thanks to innovative designs. The range of brands is impressive – with Lola, Ford, BMW, Porsche, Lotus, Corvette, Alfa Romeo, Mercedes, Marcos, and Austin Mini. A feast for the eyes, and not just for fans of British racing, will be the start of the “Triumph Competition & British HTGT”. The Triumph palette ranging from Spitfire to TR8 and models from the brands Austin Healey, Jaguar, MG and Morgan leave nothing more to be desired. One attraction is also the demonstration runs by the Passionata Maserati, which will be led by the GT1 World Champion and former Formula 1 and DTM driver Michael Bartels – fittingly, in his Maserati MC 12 GT1. Ten euros gets you in to “take a look” on Friday, tickets cost 30 euros for Saturday or Sunday and 45 euros for the weekend; admission is free for wheelchair users and children up to 14 years old – drivers’ paddock and free choice of seats included. Tickets can be bought through the online ticket shop or the hotline +49(0)6205 950-222. For further information, visit: www.hockenheim-historic.de.